Last week we got to see FX Bridge in Perth. This week, Efofex has been invited to Harvard! OK, that’s a slight exaggeration. 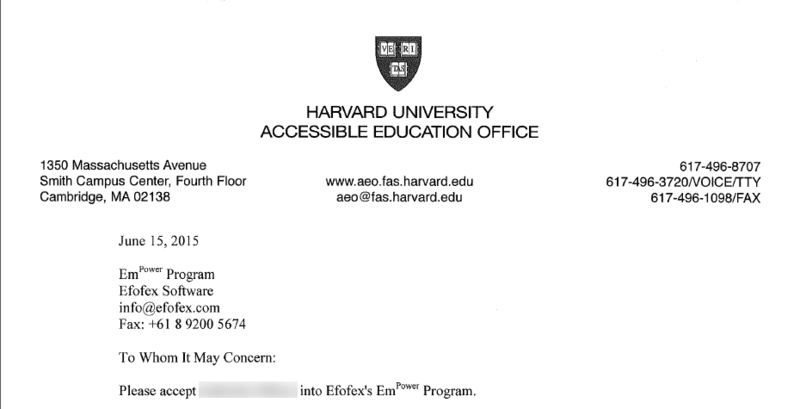 Harvard has asked us to provide software under our EmPower program for one of their students. It also provides us with another chance to remind you of our EmPower program for students with special needs. FX Equation, in particular, is so simple to use with a keyboard that it provides an ideal opportunity for students who find writing mathematics difficult. We have provided free software to nearly 2000 students all over the world and have a number of college graduates who credit FX Equation with allowing them to pursue their dreams. If you have students at your school who are having trouble with the physical side of writing mathematics, please consider looking at the EmPower program. Experience shows that it can change lives.